Be merciful to those who doubt. But it raises the question: why would God allow us to doubt to begin with? Why does He allow us to wrestle with deep questions about life, prayer, theology, pain, and suffering? Why doesn’t he just clear the air, and give us the answers and evidence we need? 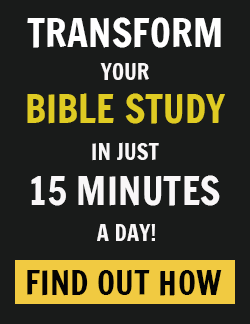 Why is the journey of faith filled with so many unknowns? What if God made the world like this to push us to deeper faith? Frederick Buechner wrote, “Doubts are the ants in the pants of faith. They keep it awake and moving.”(i) I love that. Doubts can amplify our thirst for truth. For reality. They’re a doorway to intimacy. Doubts aren’t just an obstacle; they’re an opportunity. Uncertainty can lead us into the beautiful mystery we call God. Jesus said the Spirit of God is like a wind that blows where it wishes (John 3:8). Wind can be gentle and healing, like a peaceful breeze on a summer’s day. Wind can also be a Category-5 hurricane that bulldozes everything in its path. David once said that God is our rest (Psalm 62:5). True, but He can also be the source of our distress. He is the answer, but He is also the question. He welcomes us home, then blows the house down. He is unconventional, unpredictable, unrestrained, wild — and He has a particular disdain for boxes. In fact, the last time someone put Him in one, He broke out three days later. Because God is always on the move, then it follows that our faith will be too. The story is told of Augustine, the brilliant fourth-century theologian, who was once walking along the beach lost in thought. He was attempting to wrap his mind around a theological question. He then saw a boy scurrying back and forth, carrying a seashell of water, emptying it into a hole he had dug in the sand. Augustine asked what he was doing. The boy told him: he was transporting the entire sea into the hole. Augustine laughed. That’s impossible! But then he realized that’s what he had been trying to do with God. Just when we think we’ve got God figured out, He vanishes. The more of Him we let into our lives, the faster He soaks through the limits of our understanding. And that’s why faith isn’t about getting God to fit into our holes in the sand; it’s about running to Him. He calls us not to the shore, but the ocean. He invites us to move past our fear and into His heart, deeper and deeper, until we experience His presence around us and in us. Faith isn’t about containment, it’s about possibility. Faith is skin-on-skin closeness, affinity, relationship. But to get there, sometimes our certainties need to be shattered. Our formulas disrupted. Our questions unanswered. And it’s there, in the depths of relationship, that we encounter not a list of religious clichés, but a Person. Friendship is born. kind, funny, and inexplicably loves sweet potatoes. She’s an amazing woman, and I married way out of my league. What I love about our relationship is that, although I know so much about her, there is still so much I’m learning. There are aspects to her story I’m just beginning to appreciate, glimpses of her personality that astonish me, ways she sees the world that I don’t expect. In so many ways, she is still an enigma to me. Now, because I haven’t figured her out, should I be alarmed? Should I worry that the relationship is unhealthy or broken? Do we need counseling? That’s one way of looking at it. Another perspective is that the ambiguity in our relationship is actually a sign of health, passion, and a friendship that is moving forward. Certainty can restrict love. But subtlety gives it room to flourish. Consider beauty. Something is truly sublime when it takes you by surprise. You catch your breath and you can’t take your eyes away; you didn’t see it coming. Or think about humor. Wit is the art of verbalizing the unexpected. You laugh because it’s not anticipated. Unknowns are what make life so unspeakably rich, iridescent, and engaging. If I literally knew everything about my wife — every thought, insight, emotion, move, and placement of every atom — not only would that be slightly creepy, but it would also hinder the progression of love. For example, why ask her questions if I already know the answer? What is there to learn? Why seek her if she’s already been found? It’s because I don’t know everything that the relationship feels so alive. There are secrets waiting to be unearthed. Questions aching to be asked. Dimensions of her I have yet to fully explore or understand. It’s the pursuit of love that leads to the discovery of love. Mystery is the lifeblood of intimacy. The same thing is true in our relationship with God. What if God intentionally created a world in which doubt exists because He knew it would open the door to lasting, authentic love? What if God designed it in such a way — seeing “through a glass, darkly” (1 Corinthians 13:12 KJV) — so we would ache to see Him face-to-face? What if the meaning is in the longing? It’s easy to love God when He seems so close; but true love is the pursuit of love. 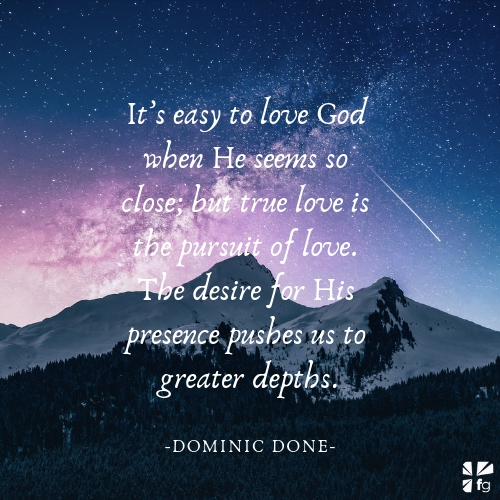 The desire for His presence pushes us to greater depths. If God is infinite, then there are infinite dimensions about Him to discover. Which means all it takes is a little obscurity, combined with curiosity, and the journey of faith begins. (i) Frederick Buechner, Beyond Words: Daily Readings in the ABC’s of Faith (New York: Harper Collins, 2004), 85. 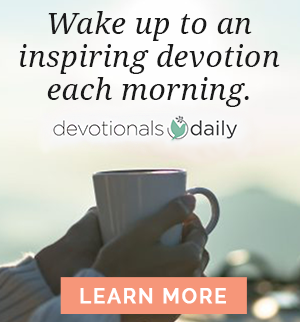 Original devotion written for Devotionals Daily by Dominic Done, author of When Faith Fails.